Synopsis: A princess, a traitor, a hunter and a thief. Four teenagers with the fate of the world in their hands. Four nations destined for conflict. I ended up really loving this book. Though admittedly, I had a hard time getting into it in the beginning. There are a lot of POVs and a lot of characters to keep track of. However, once you start learning everyone’s names and the places, it’s hard not to get completely sucked into the story. All of the characters have their own personalities and so much going on in each of their lives that you really care about what happens to them and cannot wait to return to their POV. Also, for reference there is a list at the back of the book of places and characters. Which will be super helpful when I return to the series for book 2! 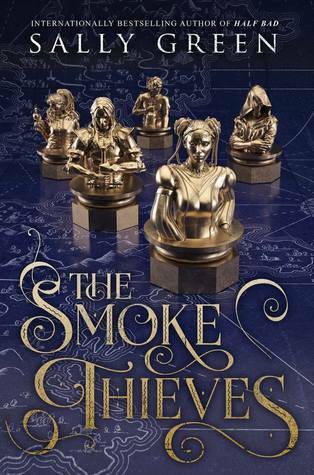 I’ve seen The Smoke Thieves referred to as Game of Thrones for teens and I can definitely see the comparison. We see perspectives from different lands, there are a ton of characters, and so much death! That being said though, I think this book stands on its own just fine and is a fantastic new high fantasy world to fall in love with. Definitely check this one out if fantasy is your thing! Thank you so much to Penguin First to Read for sending me an ARC!